Wagner DIY and semi professional portable HVLP FineSpray outfits feature 5 models to suit a wide range of different coating application tasks. The Wagner 0417003 W550 FineSpray is a hand held unit where the HVLP turbine is enclosed in the actual spray gun itself as pictured above. 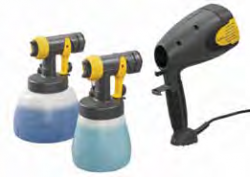 Another option is the pictured above Wagner 0417032 W560 FineSpray with 1400ml container which features 2 spray heads which can be attached, removed and swapped quickly and easily for additional versatility plus higher performance from the larger HVLP turbine. Wagner W600 Spray Gun with a W610 Fine Sprayer. A Wagner 2307653 W670 FineSpray unit as pictured above has a more powerful HVLP turbine which makes this model capable of higher outputs and the capability of handling more viscous fluids and paints. The Wagner 0420012 FineSpray 213 HVLP is the largest in the DIY and semi professional turbine HVLP paint sprayer range and features a much more powerful turbine with a metal frame for protection and ease of carrying along with a higher level spray gun with additional adjustments and controls and a metal paint cup. The FineSpray 213 also features a handy internal storage compartment and a hose storage reel. Easily compare features, specifications and prices and purchase Wagner FineSpray online at SprayGunOnline.com.au where all the above Wagner models are listed for sale.